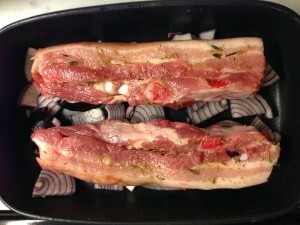 You can roast a slab of pork belly slowly in one piece, but just for one or two people, slices are very convenient. 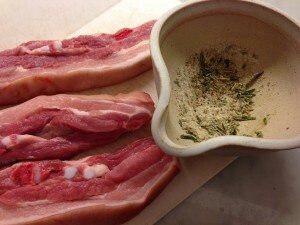 A thick slice per person should do it (our outdoor reared pork belly works out at £1 to £1.20 a slice, at £5.99/kg). Slow roasting is zero effort, just takes a bit of time. These were rubbed with a mix of crushed sea salt, fennel seeds and rosemary, laid on top of one roughly sliced onion then roast on high, 220, for 20 minutes, then for another hour and a half at 160. A real convenience food: tinned, cooked white beans. 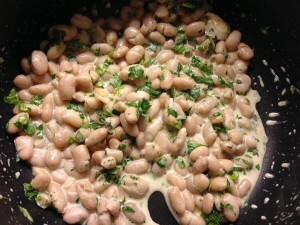 Here are cannellini which are larger and have a creamier texture than haricot, but are very similar. For two as a super speedy side dish: drain a can of beans, reserve a little of the liquid. Heat a spoonful of olive oil or butter, add one large squashed garlic clove and some thyme leaves, soften the garlic but don’t let it brown. Stir in the beans, and simply heat them up, adding a spoonful or two of the liquid from the tin. Season well with freshly ground pepper and add a good handful of chopped parsley, or some dark green leafy vegetable, such as baby spinach (which you can add raw, stir until cooked) or chopped steamed kale. Here we added a naughty dollop of single cream. 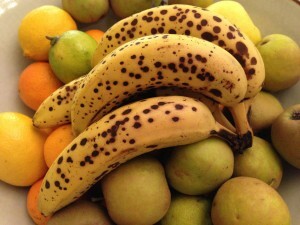 Fruit bowl rescue: in our house, the bananas are in danger of going to waste when they reach this leopard print stage. Also the cold is prone to turn bananas black. You could sling them in the freezer whole, to make into banana bread or smoothies later, but you easily might not get round to it…. Instead you can make a hot and healthy pudding almost as fast as it takes to read this. 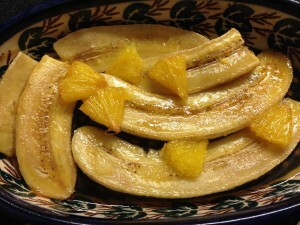 Peel and halve the bananas. 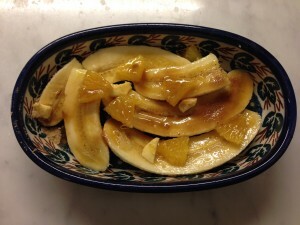 Squeeze over some lemon juice, dot with a very little butter and a teaspoon of light brown sugar or demerara. A slice of peeled orange, cut into small pieces is a nice addition as is a squeeze of orange juice. This was roast very hot for just about 12 minutes…. Into a very hot oven for 10-15 minutes. This will take kindly to a dollop of our thick Pointens cream, vanilla ice cream, yoghourt or a wicked dash of warmed rum which you can set a match to….don’t burn your eyebrows but voila, you have banana flambé!